Centella skincare was founded by Yaso Shan who wanted to formulate skincare products using natural plant ingredients to enhance and improve the skin. Using her scientific background and therapeutic experience as a medical herbalist she has put her knowledge of botanical ingredients and understanding of the skins physiology into creating a natural collection of products for every type of skin. Here at GreenFinder HQ both Kristie and I were lucky enough to sample some of the products ourselves. I loved the foot cream which contains shea butter, macadamia oil and aloe vera gel. It was not only effective at reducing dryness and cracked heels but there was a lovely cooling sensation when applied to the feet. The range of soaps in the Centella collection is varied and include French Lavender, Floral Blossom and Woodland Walk which contains extracts of black spruce and may chang. I tried the Citrus Burst variety which contains shea butter and argan oil. These ingredients mean it’s both cleansing and moisurising at the same time. With hints of orange, lemon and lime it smells gorgeous too and with its uplifting and enlivening scent it makes an ideal accompaniment to your morning shower. Kristie welcomed the opportunity to try the body lotion as she had suffered with drier skin than usual throughout the winter-perhaps all the wet weather before Christmas with a dry cold spell afterwards had taken its toll. With a subtle and pleasant fragrance of Ylang Ylang and Bergamot which she didn’t find overpowering, she found the lotion very light and absorbed quickly into the skin- ideal for her as she’s always on the go! Kristie’s next product to try is the Centella eye cream-we’ll keep you posted with the results. The collection of Centella skincare products contain no artificial ingredients, harsh synthetic chemicals and unnecessary additives. All ingredients are from sustainable sources and produced locally where possible. 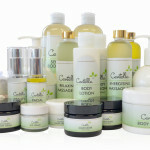 Products are available online or via mail order and also include a superb selection of gift sets and travel kits. You can visit the Centella website here to find out more.